Click / tap a topic to scroll to it. After scrolling down, a button will appear in the lower right corner of this browser window. It can be used to jump back to top. In the world of online marketing, SEO is an acronym for search engine optimization. It’s the process of fine-tuning certain aspects of a website in order to elevate the site’s visibilitya.k.a. search engine ranking in organicOrganic in this context means free, non-paid search results; refers to the section of search results in which websites have “earned” their ranking as opposed to having paid for placement in the Ads/sponsored section. search engine result pages, also known as SERPs. The goal is to achieve a sustainable increase in visitor traffic for the optimized website as a result of the improved visibility. For example, a website had a history of showing up in the upper section of page three in Google search results for popular, relevant search termsWord or phrases people use to find services, products, or information on the internet. Also referred to as keywords.. The site was seeing little or no organicFree, natural, not from paid advertising visitor traffic from search engines because most web users do not typically bother viewing (much less clicking on) search results beyond page two. In fact, on average, over 90 percent of web traffic goes to websites listed on page one of Google’s search results (Chitika study). However, after being effectively optimized using sound, white hatBest practices advocated by the major search engine providers like Google and Bing, discussed below. SEO techniques, that same website now consistently shows up (ranks) on page one of Google’s search results for very popular, relevant search terms and enjoys a sustained increase in the flow of site visitors. And that is a classic example of a successful SEO project. While no one can guarantee a page-one position in search results, properly implemented SEO strategies can be very effective. The degree to which a website’s ranking in SERPsSearch engine results pages can be improved depends upon a variety of factors, not the least of which are the quantity and quality of competitive sites. InternetLiveStats.com, the online density of some industries can make it difficult, if not impossible, to stand out from the crowd. That is why an SEO site assessment should always include a competitive analysis. In some cases, SEO may need to be combined with SEM (Search Engine MarketingPaid search ads, discussed below) to achieve enough of an improvement in website visibility to yield an increase in visitor traffic. In short, SEO is about improving a website’s rankingPosition or sequential placement in organicFree, natural, not from paid advertising web search results for the purpose of increasing visitor traffic to the site. The above example of a successful SEO project may sound simple but the underlying mechanics can be complex. Case in point, Google’s algorithmsAn algorithm is a formula or set of rules used in complex calculations or other problem-solving operations, especially by a computer. Google uses multiple algorithms in the search process and results page. use more than 200 factors (unique signals or “clues” as they describe it) to determine the sequence in which search results are listed for any given web query. While Google does not publish their ranking criteria, they do provide lots of SEO guidance. 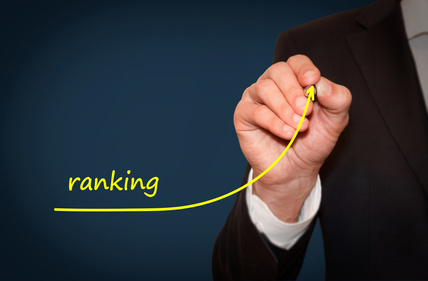 In addition to terms used on web pages, freshness of content, and region, they acknowledge that a website rating algorithm called PageRank™ is used. While PageRank™ (also sometimes referred to as link juice or Google juice) carries significant weight (it’s one of the top three Google ranking factors), keep in mind that it’s only one factor among more than 200. With that mind-numbing magnitude in mind, consider the fact that Google changes its search algorithm 500 to 600 times each year (source: moz.com). They do that of course to provide Google users with the best possible search results. However, that creates quite a challenge for website owners, retailers, and publishers striving to attain a visible presence on the internet. Of course, there are other search engine providers on the web such as Bing, Baidu, Yahoo, Yandex, etc., but Google dominates – by far. According to NetMarketShare, Google handles 71% of all desktop searches and 95% of all mobile/tablet searches. For that reason, the demand for page-one rankings in Google – for both organic and paid listings – is fierce. What makes search marketingSearch marketing is the process of gaining traffic and visibility from search engines through both paid and unpaid efforts. (Source: Search Engine Land) so uniquely effective compared to other forms of marketing such as TV, radio, direct mail, billboards, etc., is the fact that products, services, and information are presented to consumers at the exact moment those consumers are interested in and searching for those specific products, services, or information. SEO (search engine optimization) is similar to SEM (search engine marketing) in that both involve the promotion of websites within web search results. However, SEM typically refers to paid search results, or in other words, paid ads displayed on SERPsSearch engine results pages. The illustration below (Figure 1) shows how the valuable space on a Google SERPSearch engine results page is allocated between organic search results and paid search results. Examples of paid search are PPC (pay-per-click; also referred to as CPC, cost-per-click) and CPM (cost-per-thousand impressions.) They are advertising payment methods offered by the major search engine companies such as Google (via AdWords) and Bing (via Bing Ads) as well as by other online marketing organizations. Figure 2 – Commonly accepted hierarchy in earlier years of the web. Over the years, however, the term search engine marketing (SEM) evolved – for many industry professionals but not all – into something entirely separate from SEO. So, today, there’s a bit of confusion. Depending on who you ask, SEM may or may not include SEO. For example, if you download this abbreviated glossary from Google (PDF), you will see that SEM is defined as the use of online advertising on search engine results pages to help visitors find your website. Likewise, in this glossary of SEM terminology provided by Bing, SEM is again expressly defined as the process of advertising on search engines. On the other hand, there are credible sources that still define SEM as an umbrella term that includes SEO. Here are some examples. For future reference, however, I’ve decided to side with the search engine providers – Google and Bing – since they literally write the rules when it comes to search marketing. 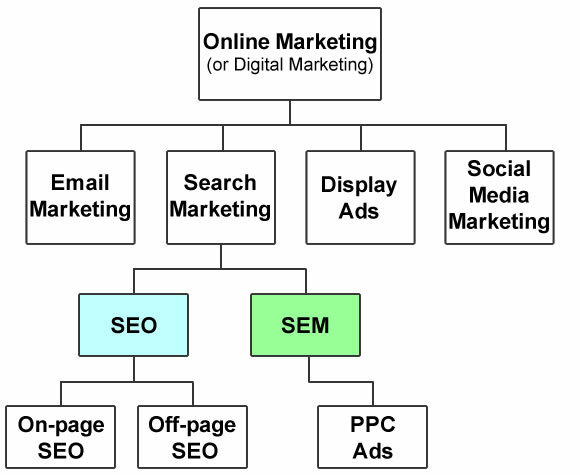 The diagram below (Figure 3), therefore, represents what I believe to be the current day hierarchy of the main elements of online marketing. 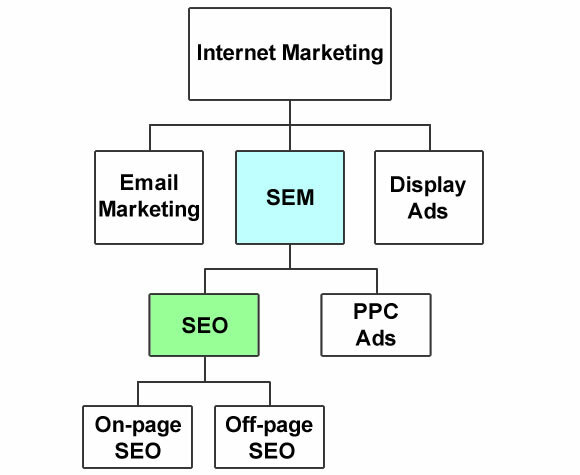 As you can see, SEO sits at the same level as SEM with both being components of Search Marketing. Figure 3 – Commonly accepted hierarchy today by many – but not by all. The definition of the term SEM can vary. In this comprehensive historical recap, Danny Sullivan, Founding Editor of Search Engine Land, explains how the definition of SEM evolved over the years to exclude SEO and how attempting to retain the original definition would have been like swimming against the tide. The web is like an ever-growing public library with billions of books and no central filing system. Google gathers the pages during the crawl process and then creates an index, so they know exactly how to look things up. Much like the index in the back of a book, the Google index includes information about words and their locations. (Source: Google Inside Search). While less common, the acronym SEO is also used to refer to a person, as opposed to a process. That is, one who specializes in optimizing websites for a living. In addition to titles such as SEO Professional, SEO Specialist, SEO Freelancer, and SEO Consultant, this individual is sometimes simply referred to as an SEO. Regardless of the designation, a common skill-set is the ability to optimize websites and improve rankings in web search results in order to increase visitor traffic for clients. Since we’re defining SEO, we might as well get clear on the proper spelling of the long form of the term. Interestingly, there’s a bit of potential confusion there as well. While the word optimization is most frequently spelled with a “z” it’s also sometimes spelled with an “s” as indicated in Table 1, below. The map below (Figure 4) shows that the British English version of optimisation (with an “s”) is predominantly used in the U.K. and Australia (in red) while the American English version (with a “z”) dominates in all other regions (in blue) where the term is used. 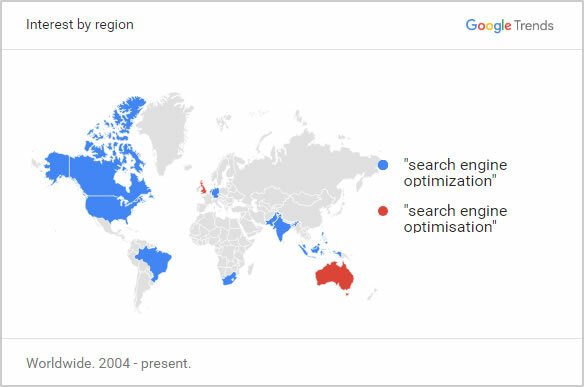 Figure 4 – Search engine optimization vs. Search engine optimisation – usage around the world. As one might glean from the names, they are based on levels of acceptable practices. 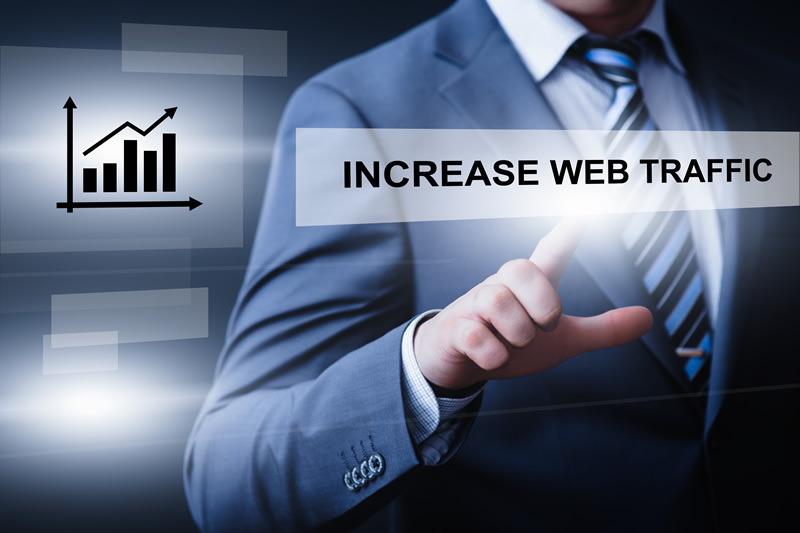 More specifically, they are based on guidelines set forth by the major search engine providers regarding website optimization techniques. The expressions white hat and black hat evolved from old western movies in which the good guys wore white cowboy hats and the bad guys wore black. Some SEO tactics are not easily classified as white or black. They can be open to interpretation and controversial. That’s where the gray hat label comes in. The following provides an explanation of each type of SEO. White hat SEO is the implementation of legitimate website optimization techniques which are not only allowed by search engine providers but are endorsed by them. The reality is, in addition to helping website owners improve site visibility on the web, white hat SEO benefits search engine providers like Google and Bing because it improves the quality of their primary service – search results. It helps search engines work more effectively in listing the most relevant, high quality query results at the top of SERPsSearch engine results pages while low quality, spam sites get filtered out. That helps keep their customers (users) happy which keeps them coming back. It is understandable, then, why Google and Bing allocate significant resources to webmaster tools, documentation, and videos explaining how website owners and their representatives can and should optimize websites for search engines. A comprehensive explanation of SEO would not be complete without mentioning the manipulative strategies of black hat SEO. In other words, what NOT to do. Black Hat SEO is the use of deceptive or unethical practices for the purpose of exploiting search engine results. That is, illicitly causing webpages to rank higher in Google, Bing, Yahoo, etc. Black hat tactics are banned by search engine providers because they compromise the quality of search results and give the infringing websites an unfair advantage. The effects of black hat SEO is usually short-lived. When search engine providers identify offenders, their websites are usually demoted in the SERPsSearch engine results pages or dropped altogether. For those unfamiliar with the concept of black hat SEO, the term might conjure up visions of career criminals and unscrupulous software hackers. The reality is, over the years, legitimate companies have participated in these activities – because they worked. In most cases, however, search engine providers eventually became aware of the schemes and implemented changes to their algorithms causing the rankings of cheating websites to sink. Today, given the risk, one might presume that black hat strategies are a thing of the past. Surprisingly, though, a simple web search for black hat seo forums will reveal a sizable sampling of sites offering information and tools for a variety of black hat endeavors. Two examples of reputable companies engaging in black hat SEO involved JC Penney and Overstock.com. According to a 2011 New York Times article by David Seagal, The Dirty Little Secrets of Search, JC Penney was embroiled in a link scheme causing Google to penalize the retailer resulting in a significant drop in search rankings. A spokesperson for JC Penney claimed the company did not authorize the bogus links. That claim, coupled with the fact that JC Penney fired their SEO consulting firm, SearchDex, suggested the SEO services provider was the bad actor. The second example of a credible company that got itself into trouble with Google for using black hat tactics is Overstock.com. Also in 2011, a story in The Wall Street Journal by Amir Efrati ran with the headline Google Penalizes Overstock for Search Tactics. The issue was Overstock encouraged college students and faculty to post links on university websites pointing to Overstock webpages in exchange for discounts on the shopping site. That violated Google’s guidelines pertaining to link schemes because it artificially increased Overstock.com’s PageRank™ score and unfairly improved its listings in Google search results. Overstock.com went from ranking at or near the very top of search results for many common queries such as “vacuum cleaners” and “laptop computers” to page five or six. The moral of those stories is, to effectively optimize a site’s standing in search results for the long term, one must know about and avoid these prohibited practices and the pitfalls associated with them. To avoid the risk of penalties and having your site demoted or delisted by search engines, it’s best to use an SEO professional who does not employ black hat tactics. Otherwise, the inevitable damage can be difficult to repair. The prudent approach – one that does pay off – is to operate within webmaster guidelines and focus on providing quality for site visitors. Content scraping – Content scraping, also referred to as web scraping, web harvesting, and web data extraction, is the process of copying content on the web and republishing it. The republished content in these cases typically provides no added value for Web users. Depending on the copyright notice of the originating site, it usually amounts to theft resulting in plagiarism and can bring about claims of copyright infringement if the rightful owner becomes aware. Not all scraped content is bad. For example, companies that harvest product and price information for reputable comparison shopping sites perform a consumer service. Some companies scrape the web for contact information while others extract data for research purposes. Web crawlers of legitimate companies adhere to robots.txt files and do not crawl or harvest from websites that opt to be excluded. Content scraping can be done manually or through the use of extraction tools. Manually, it is as simple as using copy/paste tools provided in your web browser. Extraction tools can be found at sites such as import.io, scrapinghub.com, and web-harvest.sourceforge.net. To protect your digital assets on the web, services like Copyscape.com can detect if textual content has been scraped and reposted on other websites. Automatically generated content – Also referred to as automated content and machine generated content, Google defines automatically generated content as content that’s been generated programmatically. In other words, text that has been created by software, not by a human being. It can be a collection of paragraphs on a webpage containing gibberish with keywords interspersed throughout offering little or no value to readers. The keywords are intended to match certain popular search terms in an attempt to elevate the webpage in SERPsSearch engine results pages. Automated content is also illicitly used to create webpages for the sole purpose of posting ads on the web. These websites are referred to as MFA sitesMade for advertisements or made for AdSense. The black hat webmastersPerson who maintains a website that create them look for a percentage of visitors to click an ad rather than use the browser’s back button to exit the page. In a 2014 blog post, a manager from Bing’s index quality team provides an understanding of what machine generated content is and how Bing combats it. Content stitching – In the world of search engines, content stitching is the process of copying excerpts or snippets of text from a variety of websites and re-publishing them on a single webpage while adding little or no value for readers. Even if the original content sources are cited and linked to, search engines will typically not rank webpages with stitched content because they are looking for unique content that their users will find helpful. Technically, search engines prohibit this practice because it amounts to duplicate content. The video below explains further. Article spinning – Also referred to as content spinning, article spinning is the act of modifying textual content so it can be reused on the web. It involves paraphrasing sentences, inserting new words, and replacing certain words with synonyms. The process may be manual or automated and the individual(s) responsible for the spinning may or may not be the owner of the original content. One of the objectives of article spinning is to produce content quickly without being penalized by search engines for duplicate content. Repurposed or spun articles are sometimes used to increase content volume on the same site as the original article in an effort to elevate search engine rankings. Frequently updated websites tend to rank better than more dormant sites. Another objective of article spinning is to generate backlinks. Owners of repurposed articles sometimes post them on article directories (e.g., EzineArticles, HubPages) and on other websites (as a guest blogger) so a link back to the original site can be included. An article on Linkedin’s Pulse news feed, 12 Best Free Article Rewriting/Spinning Tools Of 2016 You can Use, provides a bit of unintended irony regarding this black hat SEO tactic. A Google search on the title reveals multiple versions of the same article associated with different domains. (At the time of this writing there were three versions, on page one, all above the fold.) Comparing the text of the different versions, its safe to assume that an article spinning solution was used. The irony is, the quality of all versions of the article is extremely low, bordering on indecipherable, yet the author is promoting article spinning tools. It begs the question, who would want to use a tool that produces such low quality content? Additionally, rising to the level of oxymoronic, the Linkedin/Pulse version of the article includes multiple advertisements for How to recover from a Google penalty. Keyword stuffing is the excessive addition of search terms into a webpage in an effort to improve the page’s visibility in search results. If a page promotes a product, service, or particular message, the infused words will generally be very relevant to that content. The additional words often do not form coherent sentences and almost always do not add value for readers. The goal is to trick search engine algorithms and achieve higher rankings in search results – a risky endeavor. Cloaking is prohibited by search engine providers because of its deceptive nature. Users wind up seeing content that is different than what they were searching for. Link schemes – LinksIn the world of computers, a link is short for hyperlink. When a link is clicked, functionality built into your browser or word processing software opens or displays the target webpage. Links can also target a section of the same page which is called a bookmark. , also sometimes called backlinks, are clickable snippets of text or clickable images embedded with the URL of a target page. In most cases, they are good for your website because, as previously explained they can create PageRank™ which is good for SEO. As they relate to black hat tactics, however, links can be used in strategies that artificially inflate the ranking value of a webpage. Such methods violate search engine rules whether done with intent to deceive or not. Paid links: Search engines interpret linked citationsOne website attributing another site as the source of information or an image, for example, and including a link in the attribution. as votes of credibility and importance for websites on the receiving end of those citations (linked “to”). Accordingly, websites with more inbound links generally rank better in search results than sites with fewer backlinks. The validity of this premise relies on links that are generated through natural means (i.e., non-paid, genuine citations) rather than resulting from payments or in lieu of goods or services. Both the target site and the originating site of paid links can suffer negative ranking consequences. Link farms: A link farm is one or more websites containing pages that are laden with links for the sole purpose of inflating page importance in the eyes of search engines. As explained above, webpages with lots of inbound links tend to rank higher in web search results. These sites may link to one another in a random fashion, or in a full mesh topology (every site links to every other site in the group), or links may only exist between pages of sites with similar content. Once established, link farms are used to provide link-building services to client sites. However, as with most link schemes, over the years, search engine algorithms have gotten better at identifying link farms. Link exchanges: Link exchanges are similar to link farms in that they involve groups of websites, however, unlike link farms, link exchanges tend to be reciprocal in nature. Meaning, to receive a link from one of the sites in the group (a backlink), you must post a link to one of the sites in the group. The process is managed by a central site. This offers an advantage over direct reciprocity where each of two sites simply point a link to the other. That is more easily detected by search engines and provides no ranking value. Some link exchanges claim to provide backlinks from quality sites with similar content. Both quality and relevance are factors used by search engines to determine the value of a backlink. Nevertheless, participating in link exchanges runs the risk of a Google penalty since their Webmaster Guidelines explicitly prohibit them. Automated links: Sites that offer automated link building services provide software to do the job programmatically. Despite the fact that this practice is banned by the major search engines, a surprising number of providers can be found on the web. Examples include SEnukeTNG, UltimateDemon, and GSA’s Search Engine Ranker. Interestingly, in a tagline on its home page, SEnukeTNG overtly states that its product is … manipulating ranking factors like never before. User-generated spam – Google uses the term user-generated spam in their quality guidelines to encompass the assorted ways some website owners and marketers generate comments on other sites for the express purpose of creating backlinks in an effort to increase their site’s PageRank™. Since Google instituted the nofollow link attribute in 2005, the magnitude of this problem has decreased but it still occurs. These practices fall under the umbrella of black hat SEO when they are done in excessive volume, when the comments add no value to the topic discussed, and when implemented programmatically with bots. Comment spam on blogs: These replies in the comments section of blog articles are often completely unrelated to the topic of the article or otherwise add no value by simply posting phrases such as “Thanks for a great post!” and “Keep up the good work!” The poster will include a backlink in an effort to increase the PageRank™ standing of their site. Spam comments will often contain spelling and grammatical errors. Forum spam: Forum users create spam when they participate in a chat session on a forum site or message board for the express purpose of generating link juice (slang for PageRank™) for their own website. They ask questions or provide answers (valid or not) in discussion threads that they would not have taken the time to post if not for the underlying goal of manipulating PageRank™. Spam pages on free hosting sites: Web hosting providers such as Weebly and freehosting.com offer free packages with basic services which some users exploit to create low quality webpages to promote their own websites. This practice is prohibited by most hosting providers in their terms of service so, once identified, these spam sites are removed. Both Google and Bing specify in their guidelines that they prefer to see links built organically. That is, created by others showing confidence in the author’s content. When backlink-building campaigns are launched by webmasters and marketers using blog and forum comments in reasonable volume and with quality, its difficult if not impossible for search engine algorithms to detect. That falls under the realm of gray hat SEO, discussed below. For victims of comment spam, Google provides helpful tips in their quality guidelines on ways to prevent it. Doorway pages tend to be thin on quality content and dense on certain keywords. They are usually built for search engine bots rather than humans in an effort to place high in search engine results for certain queries. When a doorway page is selected from within search results the searcher is immediately redirected to a different webpage which may or may not be relevant to the searcher’s query. In some cases, multiple doorway pages can get listed in the same SERPSearch engine results page sending searchers to the same destination page. That can make for a frustrating user experience. Creators of doorway pages seek to expand their footprint in search results while using links or redirection methods to funnel internet traffic to a particular destination page. This practice is viewed as manipulative and deceptive by search engine providers and can negatively impact a site’s ranking in search results. In the early days of the web, many of the black hat strategies defined above were used quite aggressively by website owners and e-marketers. Over the years, however, search engine providers have updated their algorithms to protect against such techniques. Nevertheless, some webmasters still use them to try to game the system. To be clear, most black hat SEO tactics do not violate the law. They breach guidelines and policies set forth by search engine providers and are punishable by website demotion (in search results) or delisting (from a search engine’s index/database) as previously discussed. Repair and recovery can take time – and that can be expensive, especially for a company that previously enjoyed organic search engine driven traffic that produced revenue-generating customers. In some cases, the use of black hat SEO can lead to legal problems. Scraped contentContent that has been copied from websites and republished with or without the legal right to do so. (Discussed in detail above), for example, can result in copyright infringement claims which can lead to litigation. In the United States, copyright law calls for specific remedies when violators are found guilty. As with most client-vendor relationships, a prudent course of action for anyone securing website optimization services is to make sure a written agreement is in place before work proceeds. The agreement should include a clear description of the work to be done along with language affirming that deceptive, black hat practices will not be used. Don’t define your world in black and white, because there’s so much hiding amongst the greys. Before digging into the definition of gray hat SEO, one might wonder… is the correct spelling with an a or e? Is it gray or grey? The answer is both are correct. According to dictionary.com, both gray and grey are accepted in the English language. Gray is the more popular spelling in the U.S. while grey is the preferred usage in the U.K. Using either spelling of the term, a variety of definitions can be found on the web for gray hat SEO. Some SEO marketers describe it as pushing the envelope with tactics that are technically prohibited yet provide a ranking edge with low risk for search engine penalties. Others call it bending the rules without breaking them. If an SEO tactic does not comply with best practices (white hat SEO) but also does not fall into the category of prohibited practices (black hat SEO) as described by Google and Bing in their webmaster guidelines and terms of service agreements, then it qualifies as gray hat SEO. Guest blogging is an example of gray hat SEO. Guest blogging is the practice of writing an article and posting it as a guest author on someone else’s blog or website. It is often done to promote the guest author’s brand and/or website and usually includes a link to the guest author’s site. The link may or may not include the nofollow attribute which blocks the transfer of PageRank™ (defined above). Guest blogging tends to be more effective when the content of the guest author’s article is related to the content of the guest author’s website – and even more so if its relevant to the content of the hosting blog. Also, not surprisingly, higher quality guest articles tend to be more effective than lower quality. Sites that host articles from guest bloggers welcome the supplemental content because it provides fresh, *original content for their site visitors and search engine crawlers. Regular content updates can help improve search engine ranking. In addition to raising brand awareness and/or promoting a message, guest bloggers benefit from their guest blogging efforts because it can drive visitor traffic back to their website. It can also provide a ranking boost if the nofollow attribute is not required by the host and the hosting site has a higher PageRank™ than the guest author’s site. *Original content – It’s important to emphasize that guest blogging can wind up being a waste of time – and even a detriment – when the content is NOT original. For example, if an article from your own blog or website is simply re-posted on a remote website (for whatever reason: brand awareness, backlink building, etc.) the result is “duplicate content” in the eyes of Google and Bing. That will eventually result in one or both of the webpages being suppressed in search engine results. So how is guest blogging an example of gray hat SEO? So stick a fork in it: guest blogging is done; it’s just gotten too spammy. …I’d expect Google’s webspam team to take a pretty dim view of guest blogging going forward. So, one question is, how much guest blogging is too much in the eyes of Google? Also, if the content of a guest author’s article is related to the content of that author’s website, is it okay to pass PageRank™ or is a nofollow link required? The reality is, there are no clear answers to these questions. Hence, guest blogging can and arguably should be classified as a form of gray hat SEO. As touched upon in the black hat SEO section above, another form of gray hat SEO is the creation of comments at other blog sites and chat forums for the purpose of building backlinks that pass PageRank™. When done excessively with low quality remarks riddled with keywords, it’s black hat SEO (see user-generated spam, above). But when done judiciously, at a reasonable pace and volume with engaging remarks that add value to the topic at hand, it’s gray hat SEO. The reason this type of backlink-building effort is not considered “white hat SEO” is the simple fact that, technically, its prohibited by both Google and Bing when the intent is to manipulate PageRank™. They advocate that links to your site should be created by others (votes of confidence in your content) not by you. So, as with most gray hat SEO techniques, this backlink-building strategy carries a level of risk. If done too much, it could trigger a negative ranking adjustment by some search engine providers. How much is too much? No one knows. That threshold is unclear – a gray area. Finally, a third example of gray hat SEO involves automated content. Or, as Google calls it in their quality guidelines, automatically generated content (discussed above, see black hat SEO). A key assumption of the black hat definition of automated content is it has no redeeming value for readers because it makes no sense or its a complete duplication of existing content. Today, however, thanks to advancements in language modeling programs such as natural language generation (NLG), some content providers are claiming that their platforms can produce coherent, grammatically correct, useful content. If that’s true and search engines cannot distinguish NLG text from content created by humans, that would put NLG methods in a gray hat SEO category. It would not be white hat SEO because, at least at this point in time, programmatically-generated-content is frowned upon by the major search engine providers. A company called Automated Insights, Inc., claims to be the #1 producer of personalized content in the world. Their platform, Wordsmith, is a natural language generation (NLG) engine. In an article titled How Does Google Treat Automated Content? they make a pretty good argument for why their automated content should not incur Google ranking penalties. To recap, search engine optimization methods can be broken down into three categories: white hat SEO, black hat SEO, and gray hat SEO. The differences are based on the degree of adherence to quality requirements established by the major search engine providers. Each approach carries with it a level of risk in terms of ranking penalties. White hat SEO is a zero risk approach unless mistakes are made. When using the services of an SEO professional, it’s important to get clear on the tactics to be implemented and the risks involved, if any. Figure 5 – Interest in search engine optimization has grown significantly over the years having surpassed advertising agency and pay per click in Google search volume. With the explosive growth of the internet during the past couple of decades, it’s no surprise that interest in SEO has grown significantly as well. Today, businesses of all sizes understand the breadth and depth of the World Wide Web and the unique opportunity it offers with its constant stream of queries from consumers of products, services, and information. 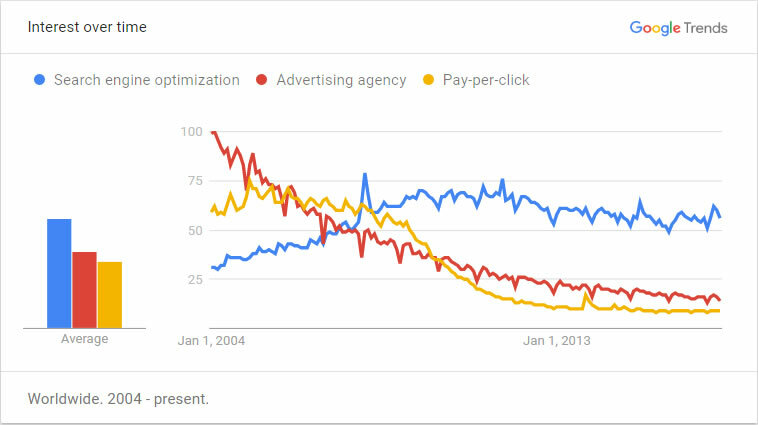 As you can see in the Google Trends chart above (Figure 5), since 2004, the number of Google searches for SEO have surpassed the keywords advertising agency and pay per click. People clearly want to know more about it and/or find providers of SEO services. Unlike paid advertising, marketing spend on SEO is an investment in the future of a website. SEO enhancements can have a lasting beneficial effect on visibility and brand awareness whereas the impact of paid search results (e.g., PPC, pay-per-click ads) stops when the ad funding stops. It’s not voodoo. It’s not magic. And it’s not a scam. SEO is an essential service for the website owner looking to increase organic trafficWebsite visitor traffic from free, non-paid listings in search engine results pages (SERPs) to their site – traffic comprised of consumers searching for the exact products, services, or information their website offers.